We have developed this simple step by step method that will allow you to positively identify your vehicle. This will enable you to order the correct parts and publications that you require for your repair or restoration. 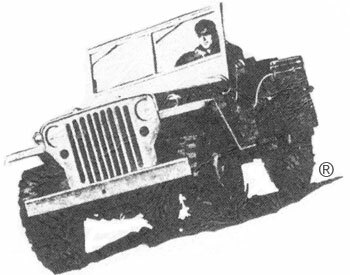 Be aware though, someone always seems to have had a better idea than the Willys-Overland engineers. Engines, transmissions, axles, leaf springs, brake and steering systems are swapped for the sake of “better performance”. Rear body panels are cut out for a tailgate, tailgates are removed and sheeted over, monstrously heavy front and rear bumpers added, windshields are swapped from one model to the next, seats, gauges and fuel systems are “upgraded”. 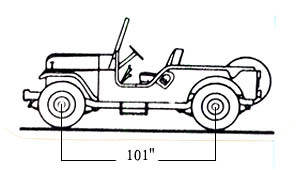 Finding a truly “original” Willys is quite a rarity and we can help you restore yours to that original configuration. 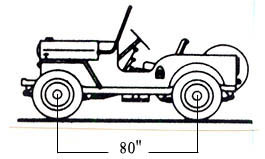 The easy way to narrow your vehicle down is to get a tape measure and a buddy and measure the distance from the center of the front wheel hub to the center of the rear wheel hub. 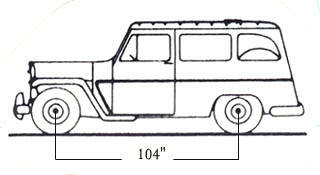 This figure is known as the vehicle WHEELBASE. 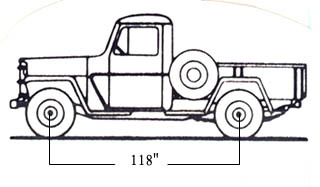 There are only six possible options for wheelbase lengths. After you have determined the wheelbase go to the appropriate section and follow the steps and you should be able to make a positive identification in a matter of minutes. 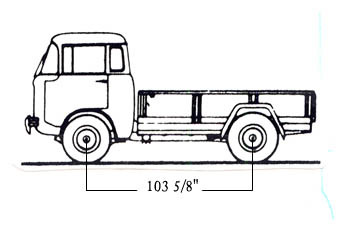 We have included illustrations of every model in original factory configuration to allow you to see what your vehicle is supposed to look like. 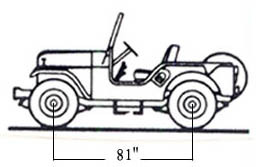 Copyright 2005-2014 WILLYS JEEP PARTS LLC. All rights reserved.